Emily Brewin is a quiet achiever. Not only is she an accomplished English and Media secondary teacher, in the early mornings and late into the night she is an author. 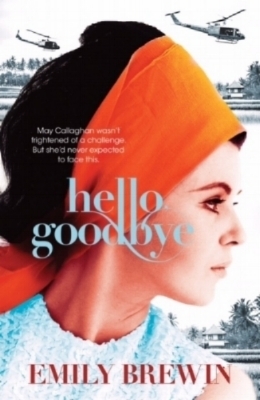 As a former colleague and longtime friend, I have watched Emily's rise with fascination, in admiration of her commitment to her goal - publication of her novel Hello, Goodbye in 2017. Emily is fiercely determined, tenacious and incredibly patient. She penned her debut novel while raising two young children, working as a teacher, and studying writing. This is not a woman who does things by halves. Whether you're a freelancer, writer or reader, I know you'll be interested in Emily's processes and musings on her work. Enjoy! In the work you do, how important are the right words? In the published form, the words can make or break a novel. You may have a fantastic story, but if the words fail to bring it to life, it won’t keep readers reading. Saying that, I think the right words are less important in those initial drafts. First and second drafts for me are mainly about getting the story down, rather than crafting sentences. The end product is a bit of a dog’s breakfast but it gives me something to work with and to shape into something more palatable. Usually the alarm clock on my phone, which rings at an ungodly hour. I tend to write early in the morning or late at night when my children are in bed. Apart from that, I’m driven by a desire to create something that belongs just to me, that I can disappear into and take pride from. Writing is exhausting, thankless work at times, but there’s also no better feeling than seeing a story that’s lived in my head coming to life on the page. I am a secondary school teacher as well as an author. I went into teaching because I don’t think there is a greater gift to give than education. And, there’s a certain type of magic that happens when a young person becomes engaged in a topic or begins to see the world from a new perspective. Writing is similar in that it has the power to transport us to another time and place. I love that it allows me to stand in a character’s shoes and to see through their eyes. I tend to write as a way of understanding people, issues and the world around me. I believe that fiction in particular encourages empathy, and that society as a whole could do with a bit more of that. What are the most effective ways you market your book and, indeed, yourself? Word of mouth is still one of the most effective ways to sell books, although a major literary prize never goes astray. I didn’t think seriously about the business side of writing until my first novel, Hello, Goodbye, was published and I witnessed the power of publicity. I’ve since learnt that social media is a great way to build a profile, although, it does take time and commitment to do properly. I think that people, especially young people, are much more media savvy. There is an expectation these days that authors will have and maintain a social media presence, which publishers can tap into to sell books. What is the best piece of advice you could give to other writers/freelancers? Talent will only get you so far. Determination, discipline and a willingness to learn from your mistakes is just as important, as is connecting with other writers. In terms of being an author, being able to survive on very little sleep so that you can write at either end of your day job is also a must. To learn more about Emily and her debut novel Hello, Goodbye, visit her website. For assistance with marketing your creative work, generating a social presence or other communications bits and pieces, holla at a copywriter!